This statistic shows the monthly revenues generated per television subscriber in Canada from 2009 to 2016, by service. 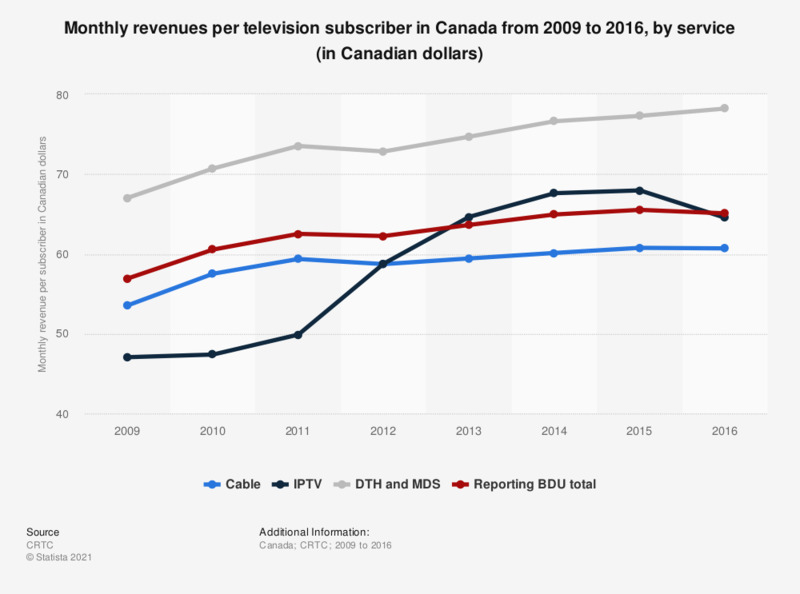 In 2016, Direct-to-Home (DTH) and Multipoint Distribution Service (MDS) generated the highest monthly revenue per subscriber with 78.22 Canadian dollars. Internet Protocol Television (IPTV) generated the second highest monthly revenue per subscriber with 64.52 Canadian dollars. Monthly revenues per subscriber are calculated by dividing the annual BDU revenues from basic and non-basic services by the average number of subscriptions in the year. The result is then divided by 12 to obtain the monthly amount. The average number of subscribers is determined by dividing the sum of the number of subscribers at the beginning and at the end of the year by two. Figures for periods before 2011 come from previous reporting.